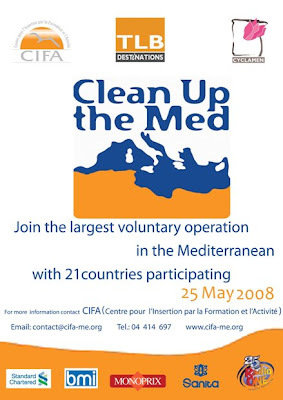 The three-day "Clean Up the Med" campaign includes a day for information dissemination, a beach clean-up day, and guided conservation tours. Sanita sal, leading consumer disposables manufacturer in Lebanon, will co-sponsor the 2008 Clean Up the Med campaign from 23 to 25 May 2008. Sanita regularly supports environmental events, which promote taking responsibility for a beautiful country and using environmentally friendly products. Centre pour l’Insertion par la Formation et l'Activité (CIFA), a Lebanese NGO, has organized activities during the three-day campaign, culminating in a beach clean-up activity to remove litter from the Lebanese coastline on Sunday, 25 May. CIFA, founded by incoming tour operator TLB Destinations, contributes to development issues in Lebanon by improving awareness of environmental and cultural issues, providing training and social development for the unemployed, and supporting children and the elderly. Likewise, Sanita addresses social and cultural needs as part of the corporate mission of its mother company: "What is good for the community is good for the company."